The seeming lack of direction at Ford (F - Get Report) has not done the stock price any favors. While shares are up over 11% so far this year, keep in mind the overall markets have been rebounding over the past few weeks after a rather tough fourth quarter. Ford shares closed Tuesday down 0.87% at $8.51. Still, shares of Ford are down almost 20% over the past six months and almost 30% over the past 12 months. What seems to be the problem? From a valuation standpoint, stocks like Ford, General Motors (GM - Get Report) and Fiat Chrysler (FCAU - Get Report) don't get much love. While admittedly lacking growth on both the top and bottom line, investors need to see something out of these automakers -- besides a dividend yield -- that makes them want to buy. Most investors appear to have one foot out the door, anticipating a slowdown in global and domestic growth that will eventually cripple the auto market. In a way, automakers have already been positioning themselves in such a way by changing their vehicle mix. At one point, autonomous driving technologies were supposed to power Ford into a new arena. But the strategy from the company seems to change at a frequent pace. Case in point, Ford now plans to introduce level 3 driving vs. skipping right from level 2 -- where the car can steer, brake and accelerate in certain situations -- to level 4. At level 4, the vehicle can essentially drive itself in specific areas or on specific routes or geofenced areas. That was the automaker's plan in 2016 and while it still plans to introduce level 4 driving in 2021, it will now introduce level 3 along the way as well. Originally, the company had planned to go from level 2 to level 4 because at level 3, the car has plenty of capability most of the time does not mean it's capable of autonomous driving all of the time. That leaves the driver, their passengers and other drivers on the road at risk if they're not paying attention. Let's be honest, too, it's hard to stay 100% focused on driving if we're not actually driving for large chunks of time. This was a unique approach and something that was supposed to set Ford apart from its rivals like GM. Unfortunately, maybe modeling a company like General Motors would have been better. In 2016, GM acquired Cruise Automation for roughly $1 billion. After investments from SoftBank (SFTBY and Honda Motor (HMC - Get Report) , Cruise is now worth more than $14.5 billion. To industry observers, Cruise is just behind Alphabet's (GOOGL - Get Report) (GOOG - Get Report) Waymo in the autonomous taxi segment, while GM's own autonomous unit was recently ranked the best against its peers. Ford's $1 billion Argo bet? No one's going to call it a flop, but it hasn't seen its valuation soar to $14.6 billion like Cruise. 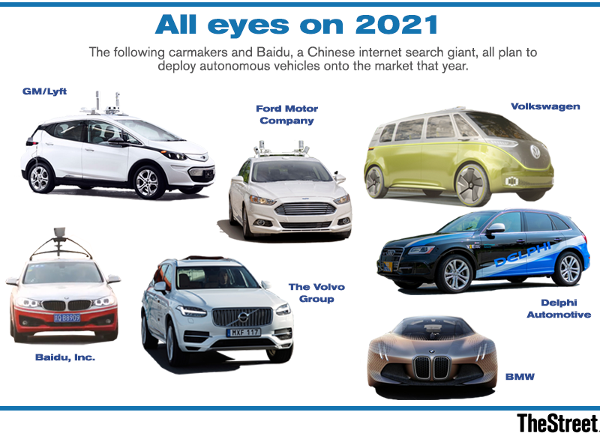 Ford's own autonomous work hasn't panned out quite like GM's either, with the company still bouncing back and forth on how it will progress between each level. So the disappointment from Wall Street isn't so much that investors don't believe in the company, but more so that the communication from Ford has been so mixed. CEO James Hackett has grand plans for reshaping mobility as a whole, not just having a hands-free commute in select markets. But thus far, Ford has had trouble telegraphing how it's going to get from the present, Point A, to where it wants to be in the future, Point B. At this point, reincorporating plans to introduce level 3 capabilities isn't a poor choice, nor will it derail where the automaker is heading over the long term. But Ford needs to get real here and lay out a more concrete plan on how it's going to achieve success.